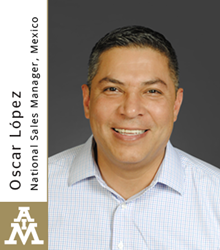 AIM Solder, a leading global manufacturer of solder assembly materials for the electronics industry, is pleased to announce the appointment of Oscar López to the position of National Sales Manager, Mexico. Oscar will plan and coordinate the activities of the AIM sales force and sales channel partners within Mexico. He will play a key role in providing analysis of the market and feedback to local and corporate management to drive AIM’s continued growth in this important region. With an International MBA in Total Quality Six Sigma, Oscar brings over 19 years of experience in distribution and supply chain management within the industrial, electronics, electrical, home appliances, metal, automotive and aerospace industries. Based in Ciudad Juárez, Oscar may be reached by phone at +52 656 148 89 01 or by email at olopez(at)aimsolder.com. Headquartered in Montreal, Canada, AIM Solder is a leading global manufacturer of assembly materials for the electronics industry with manufacturing, distribution and support facilities located throughout the world. AIM produces advanced solder products such as solder paste, liquid flux, cored wire, bar solder, epoxies, lead-free and halogen-free solder products, and specialty alloys such as indium and gold for a broad range of industries. A recipient of many prestigious SMT industry awards, AIM is strongly committed to innovative research and development of product and process improvement as well as providing customers with superior technical support, service and training. For more information about AIM’s complete line of advanced solder products and global technical services, please visit http://www.aimsolder.com.